Figure 3.32 Components and Structure of Peptidoglycan Chemical structure of W-acetylglucosamine (NAG) and W-acetylmuramic acid (NAM); the ring structures of the two molecules are glucose. Glycan chains are composed of alternating subunits of NAG and NAM joined by covalent bonds. 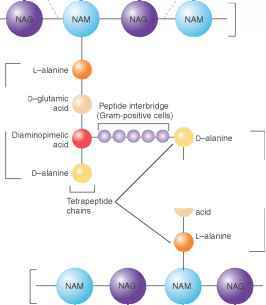 Adjacent glycan chains are cross-linked via their tetrapeptide chains to create peptidoglycan. outer membrane, a unique lipid bilayer embedded with proteins. The peptidoglycan layer is sandwiched between the cytoplasmic membrane and the outer membrane.